This year’s Wireless West Conference has come and gone. People traveled from all over to the gorgeous desert of Scottsdale, Arizona to participate in three days of education from thought leaders, expert analysts, networking opportunities and much, much more. Md7 was also on hand and if you didn’t have the pleasure of attending yourself, we just wanted to take the opportunity to quickly catch you up on all that you missed. Md7 made sure that the event got started off on the best foot possible by way of a “Welcome Reception Party” that we hosted. 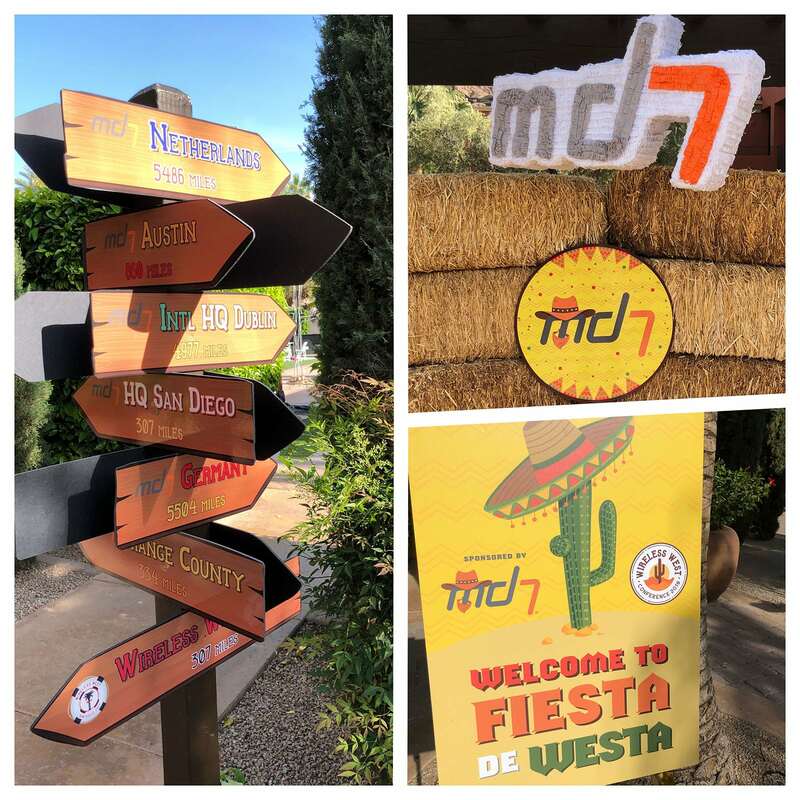 Not only did we get the chance to rub elbows with hundreds of people from the wireless industry, but the food and drinks were great, and there was a Mariachi band to help set the tone for everything that followed. Perhaps the most informative attraction of this year’s conference was a fascinating panel discussion on artificial intelligence and augmented reality. While this wasn’t explicitly an Md7 presentation, our representatives were there in full force on the panel to give their thoughts on possibly one of the most important tech trends in the wireless industry to come along in a generation. Others were also present, including those representing everything from drone technology to laser scanners (for mapping) and more. The overwhelming agreement from people in attendance at the conference – something that was also echoed during the panel discussion – was that the infrastructure industry is simply not ready for the impending 5G revolution we are about to go through. This is due in no small part to a labor shortage – there simply aren’t enough people available to fill the jobs needed to get the work done that 5G will require. Md7 is just one of the many examples of a company that is trying to use technology to solve this problem. During the AI/AR discussion we talked about our new tool, Contract Analyzer to read and sort lease data and the Scout Mobile App, which allows wireless carriers to work “smarter, not harder” in terms of 5G preparation – all without having to add more people to their teams. All told, this year’s Wireless West Conference was truly an unforgettable experience – and we’re already looking forward to next year. 5G networks will require the deployment, tracking, and management of an unprecedented number of new antenna sites. Disruptive technology is needed to keep up. This panel will discuss how rapidly evolving technologies like Artificial Intelligence (AI) and Augmented Reality (AR) offer outside the box solutions for the development and ongoing operation of hundreds of thousands of new sites. The third annual Wireless West Conference is just around the corner, and we are excited the show will be in our backyard, downtown Los Angeles – or “DTLA” as locals like myself call it. Over 500 industry professionals are expected to attend, which is impressive for any infrastructure conference, let alone one lead by the local state wireless associations, Arizona Wireless, California Wireless, Colorado Wireless, Nevada Wireless, and Northwest Wireless. Md7 will once again host the opening night reception on April 10th at the rooftop pool area, starting at 7:00 PM. If you aren’t sure whether you will join us at this year’s show, here are some of the reasons we continue to support this conference year after year. At some conferences, you hang out at the lobby to network rather than attend a panel session on a hyper technical topic, or one that is a poorly disguised sales pitch from a wireless industry vendor. Being a member of the Wireless West planning committee, I can attest to the amount of research and planning Co-Executive Director Patti Ringo puts into every session so that the conference covers the cutting edge issues facing the West Coast and Rocky Mountain regions. This year, the show will include a discussion on the current state of the Federal Communication Commission’s Broadband Advisory Council (commonly called BDAC), especially following the high-profile resignation from the Council by San Jose mayor Sam Liccardo. We look forward to learning more about the industry’s response to the claim by 36 mayors that the FCC is not properly focused on removing barriers to broadband deployment. Additional topics include smart cities, trends in wireless hiring, and of course, small cells. Los Angeles Rams CTO, Skarpi Hedinsson, and COO & EVP of Football Operations, Kevin Demoff, will discuss the technology investments at the Inglewood Stadium, the future home of the Rams and Chargers. Early reporting on the stadium’s “Oculus” immersive experience video board suggest next-generation technology befitting the long-awaited return of Los Angeles as a two-NFL team city. Los Angeles fans are notorious for leaving large venues early to beat traffic, so if the stadium fan experience gets locals to stay through the end of a home game, that will be impressive! Conference Co-Executive Director Kari Willis, and her E-Factor team, take the industry trade show experience to the next level. They pour their heart and soul into every detail so that conference attendees needs are anticipated, and expectations exceeded. In short, we wouldn’t miss it and we hope to see you there! Next month marks the second annual Wireless West Conference, which will be be held April 19 – 20, 2017 at the newly renovated Marriott Marquis & Marina in San Diego, California. Md7 will be sponsoring the opening night networking social. We hope to see you there! Wireless West is hosted by five west coast wireless associations — the California Wireless Association, Northwest Wireless Association, Arizona Wireless Association, Nevada Wireless Association, and Colorado Wireless Association. Md7 is excited to support the efforts of this amazing conference, which in its inaugural debut last year brought together over 500 wireless professionals from all corners of the industry to share ideas on cutting edge industry issues, particularly those faced in the West Coast and Rocky Mountain regions. The 2017 conference will cover smart cars and smart cities, regulatory issues under the current administration, drones, and social media.